Note: To register and start receiving contribution data, you need to be on Simple Fund Version 2014.3 or later. Warning: Your fund needs to be registered with BGL/Australia Post for the contribution data to flow electronically into the BGL software. Only providing the ESA to the employer without registering the fund may result into the contribution data being rejected and returned to the clearing house or payroll provider. This section contains general information about SuperStream. Click [show] for more information. SuperStream is the new standard for super transactions designed to improve the quality of data and improve processing efficiency for both employers and super funds. SuperStream Gateways will collect your contribution data from employers and distribute this data to your SMSF. As part of this, all SMSFs must comply with the new data and e-commerce standard from 1 July 2014. This means that employers will be able to send superannuation contributions data to multiple funds in one standard electronic format, instead of sending information to separate funds in multiple formats. BGL has partnered with Australia Post as our SuperStream Gateway. Each gateway has a unique ESA which trustees need to pass on to the employer. The employer will then send the contribution data to that ESA. Australia Post will receive the data from the employer. Simple Fund and SF360 will then retrieve the data from Australia Post. Note: All BGL clients must use Australia Post as their default gateway as Simple Fund and SF360 will not integrate with any other gateway provider. If you register with another gateway, you will not be able to load the SuperStream data into Simple Fund and SF360. Simple Fund and SF360 users are able to bulk register their funds faster through the software. Which SMSF needs to register? It is recommended that all SMSFs are ready to receive employer contributions in the new SuperStream format from 1 July 2014. Simple Fund 2014.2 or later allows you to register SMSFs for SuperStream. You need to register your clients with Australia Post through Simple Fund. If you register through Simple Fund, Australia Post will charge only $7 plus GST per fund per annum for the service. If your clients (SMSF trustees) register directly with Australia Post, they will be charged $50 plus GST for a 1-year subscription. Invoicing and renewals will be handled by Australia Post. The SMSF trustees must pass on this information to their employer by' so that the employer can send the contribution data to the correct gateway. Contribution data will then be delivered to Australia Post. BGL will collect that for all your registered funds which can then be downloaded into Simple Fund. 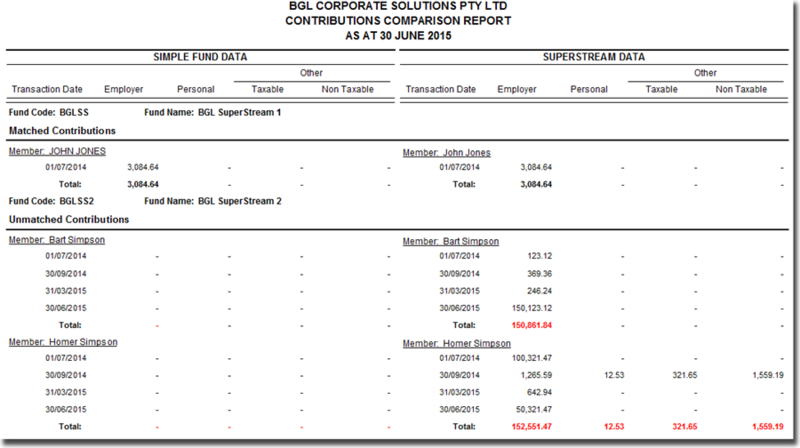 By now, you should have contacted your clients (SMSF trustees) and informed them of the new SuperStream requirements and that you are going to register them with Australia Post through the BGL software. How do I prepare the letters in Simple Fund? Go to Modules | Automated Processing | Superstream Letters. Alternatively, if you wish to prepare the letters for the selected fund only, go to Reports and Documents | Financial Reports | SuperStream. Tick the box for Simple Fund to print the date on the letters. Otherwise, if you leave it unticked, the date field will be blank and you can manually input the date. Click to select the funds for which you wish to prepare the letters. Click Select to confirm your selection. The number of funds will show next to Select Funds. Click Print or click , or to export the document to PDF, Word or Excel. Note: If you have generated the letters from the Automated Processing screen, you will be provided with a Multi Fund Reporting Summary Report at the end with a list of the funds for which the letters have been created. The letters will be saved in the FUND folder located in the SFUND folder. You can then follow the instructions in this help to bulk register funds to SuperStream. 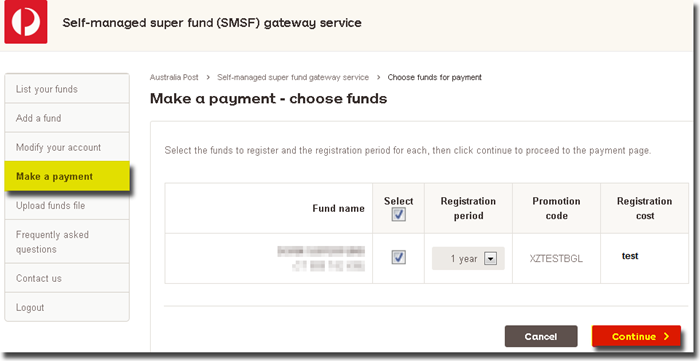 Simple Fund Version 2014.2 or later enables SuperStream registration for your SMSF. Simple Fund will generate a file with your fund name and ABN. This file will be transferred to Australia Post. Contribution data is then delivered to Australia Post. BGL will collect SuperStream data from Australia Post for registered SMSF. You can then download the data into Simple Fund. In order for you to download the contribution data through Simple Fund, you need to register with Australia Post through Simple Fund. If you register through Simple Fund, Australia Post will charge only $7 plus GST per fund per annum for the service. If you register directly with Australia Post, the charge is $50 plus GST for a 1-year subscription. By now, you should already have sent the Employer Notification Letter to your employer to advise them of the SuperStream details. Go to Reports and Documents | Financial Reports | SuperStream. Put a 1 next to the Employer Notification Letter. You can then register your fund with Australia Post through the SuperStream screen in Simple Fund. For more information on SuperStream, refer to the ATO's website. The SuperStream screen allows you to register fund(s) with Australia Post so that contribution data can come through directly into Simple Fund. The fund also needs to have an ABN attached under Fund Details | Details before you can register it with Australia Post. You need to be on Simple Fund Version 2014.2 or later and the fund also needs to be on Version 2014.2 or later in the Fund Selection screen. If the fund has not been updated, tick the box to the left of the fund and click Update. From the Simple Fund Explorer, click SuperStream. You can access the ATO Super Choice Form by clicking on the icon. This form allows employees to advise their employer of their choice of super fund. You only need to register once for your firm. Please ensure you fill in ALL the fields as they are ALL mandatory and are required by Australia Post. An address is required for future correspondence from Australia Post, for example, for Registration Renewal Notifications. The Email address will be the account login and will be used as the primary contact for the account. The Password is not stored in Simple Fund. 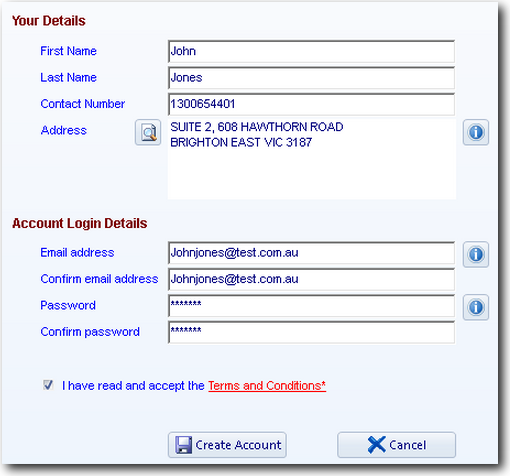 You will need to input the password to log in to the Australia Post website. Tick the I have read and accept the Terms and Conditions* check box and then click Create Account. Note: If you cannot see the Create Account icon, it is possible that you may need to adjust your monitor display settings. Refer to FAQ 12213 for instructions on how to adjust the display settings. If this does not work, check your screen resolution. To abort the registration process, click Cancel. Once you have successfully registered, you will be taken to the Fund Registration tab. You will also receive a confirmation email from Australia Post which contains an activation link. Note: If you do not receive any email from Australia Post after a few hours, you will need to check with your network administrator that emails from Australia Post are not being blocked. Refer to FAQ 16666 for more information. 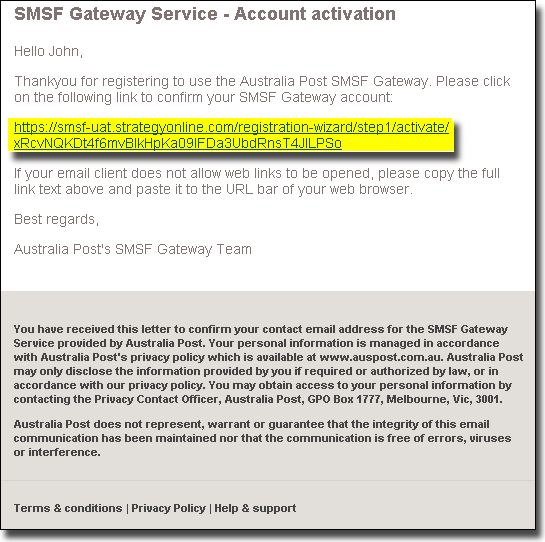 You will be taken to the Australia Post SMSF gateway service webpage. The email address will be pre-populated. You need to input the password that you used when creating the account in Simple Fund. Click Login. Once logged in, the following screen will come up. Since no fund has been registered yet, the List of funds associated with your account with your account will be empty. Warning: Do not click Add a fund on this page to register any fund with Australia Post. Funds registered through the Australia Post website will not be updated in Simple Fund and you will not be able to get contribution data for these funds through Simple Fund. To register a fund, go to the SuperStream >> Fund Registration tab in Simple Fund. The account details stored in Simple Fund are purely cosmetic. Any changes made do not get sent to Australia Post. If you wish to change the Account Details, this must be done via Australia Post's website: https://smsf-gateway-auspost.com.au/. Note: Any changes made via Australia Post's website must be manually updated in Simple Fund. Click Change Registration Details next to Registered Email to amend the details. Click Save Changes to confirm any changes made or click Cancel to abort the changes. Simple Fund displays all the funds with an attached ABN. If a fund is missing from the list, you need to ensure that the ABN has been entered under Fund Details | Details for that fund. If a fund has been migrated to SF360, it will also not be on that list. Select the fund(s) you wish to register by ticking the box to the left of the fund(s). To select all the funds, click Select All. To clear all the funds that have been selected, click Clear All. Click Register/Payment to register the fund with Australia Post. After you register the fund in Simple Fund, the status will change to Awaiting Confirmation and then to Pending Payment. You will need to process a payment on the Australia Post website and an invoice will be sent to the email address used during registration. You can click the link under the Account Details tab to access the Australia Post SMSF Gateway Service website where you will need to input your email address and password to log in. Ensure you are in the Make a payment screen. Select the fund(s) you wish to register and then click Continue>. Enter the payment details and once the payment has been processed, the status will change to Registered and the expiry date will be displayed in Simple Fund. Note: After processing the payment, the status may not change to Registered immediately. There may be a slight delay. If the status does not change to Registered, click Check for Pending Request(s) to update the status. If the Status is other than Not Registered, the ABN is greyed out under Fund Details | Details. You can change the fund by clicking into the Fund Code. To cancel registration for a fund, tick the box to the left of the fund and click Cancel Registration. The status will change to Awaiting Cancellation until Australia Post processes the cancellation. The status will then change to Cancelled. Note: No refund will be provided by Australia Post for any cancellation once payment has been processed. Once a registration has been processed and paid for SuperStream with Australia Post and you cancel the registration, you can re-register that fund through Simple Fund if required in the future. The Expiry Date will display in red one month prior to the expiry date. Refer to FAQ 17281 for more information. Click for Simple Fund to refresh the statuses of the funds if any changes have been processed by Australia Post. For example, if you have registered a fund and payment has been successfully processed through Australia Post's website, you need to click Check for Pending Request(s) in the SuperStream screen in Simple Fund for the Status to change to Registered. This allows you to filter the funds to display. For example, you can filter the list of funds to show only Registered funds. The following table lists the different types of status that you may come across when registering a fund for SuperStream in Simple Fund. Awaiting Cancellation Waiting for Australia Post to cancel the registration. Cancelled The registration for this fund has been cancelled. Pending Payment You need to process a payment for this fund. Registration Expired The registration for this fund has expired. You need to renew the subscription. Awaiting Confirmation Fund has been sent to Australia Post for registration. Not Registered All funds will initially have this status. 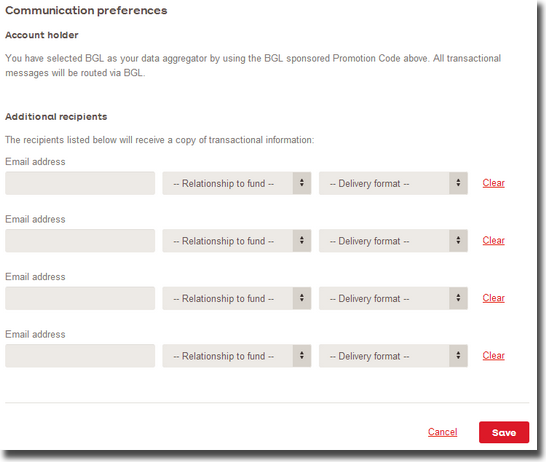 Registered Fund has been added to the Australia Post Gateway and can receive contribution data. Registration Failed An error has been encountered during registration. An error message will display on-screen to advise you of any issues. Once the issue has been fixed, the fund needs to be resent for registration. This option should be selected where the contribution transactions have already been downloaded into Simple Fund from another source (e.g. BGL Bank Data Service or Bank Feed) or have been manually coded. This option will NOT upload any transactions to the ledger. Instead, this option will use the SuperStream data to generate a contribution comparison report to check the existence and completeness of all contribution transactions against the SuperStream data. Selecting this option will upload and create contribution transactions in the ledger. Warning: Selecting this option, where contribution transactions have already been brought in via another upload source, will cause duplication. In addition, as part of the transaction creation process, the system will automatically create the SMSF Bank account in the Banks screen and Chart of Accounts if this bank account has not already been set up. You also have the option for Simple Fund to create the member account in the Members screen by selecting the Automatically create member accounts? option under Advanced Options. Select the financial year from the drop-down list. Upload future period transactions? Select this check box to load future transactions from the upload file which do not fall within the Download Period selected. Use transaction upload validation screen? Select this check box to view the Transaction Upload Validation screen to allow you to review any validation errors. Automatically create member accounts? Select this box for Simple Fund to automatically add the individual to the People database and create a member account for that person if the person doesn't already exist. Simple Fund will try to match the TFN of the individual with existing members first. If no match is found, Simple Fund will create the member account. Note: This option does NOT apply if Upload Contribution & Rollover Data has been selected under Upload Options. Select Funds to Exclude Click to select the funds to exclude from the upload and click to confirm your selection. Click to upload data based on the upload and/or advanced options selected. Note: when uploading super stream data ensure no other users are in other funds. Simple fund will not upload contribution information for funds which other users are working on. The following message will display to advise that the contribution data has been downloaded into Simple Fund and you can view a comparison report. If you have selected Upload Contribution & Rollover Data and create Transactions under Upload Options, the SuperStream Transaction Upload Summary screen will display. Refer to the SuperStream Transaction Upload Summary help for more information. Click Previous Uploads to reverse transactions uploaded through SuperStream for the currently selected fund(s). You will be taken to the Previous Transaction Uploads screen to select which set of transactions to reverse. Note: If Data Import Rules have already been set up to automatically filter and code contribution transactions each time a bank upload is processed, you do not have to use Transaction Matching and Review as the transactions should already be coded to the respective contribution accounts with the set of data import rules in place. 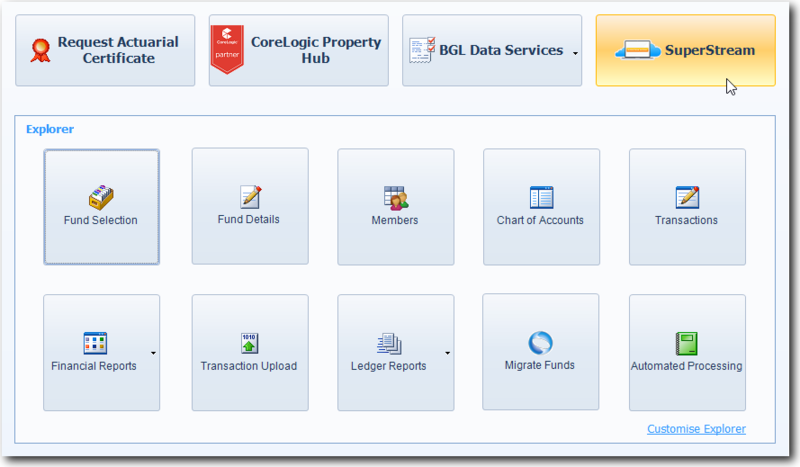 From Simple Fund Version 2015.0, users are able to automatically match off bank transactions downloaded via the BGL Bank Data Service or any other bank data upload against the contribution data from SuperStream. As the bank transactions from the bank data uploads are initially posted to the 998 clearing account, Transaction Review allows users to code those transactions from Account 998 to the appropriate contribution accounts. Before using the Transaction Review feature, contribution data must first be downloaded from the SuperStream Gateway using the Upload Contribution & Rollover Data option above. This is required for Simple Fund to be able to match off the transactions in the Transaction Review screen. From the Transaction Review screen, select the fund(s) and input the period. Under Matching Criteria, select SuperStream. This will list all contribution data downloaded from the SuperStream Gateway. Based on the date and amount, Simple Fund will try to match the contribution data from SuperStream and the bank transactions recorded to Account 998 from any bank uploads. The contribution transactions will be automatically matched and allocated to existing accumulation members. Matched transactions will be highlighted in green. Once you have matched all the transactions, select Save. To access the Advanced settings, select Switch to Advanced Mode. The Advanced section allows users to customise the tolerance days and amount. Users can choose to have the system automatically create member accounts if there are no existing Accumulation member accounts available. This check box is ticked by default. Clicking the Allocate button will then match the transactions based on the additional Advanced Options selected. 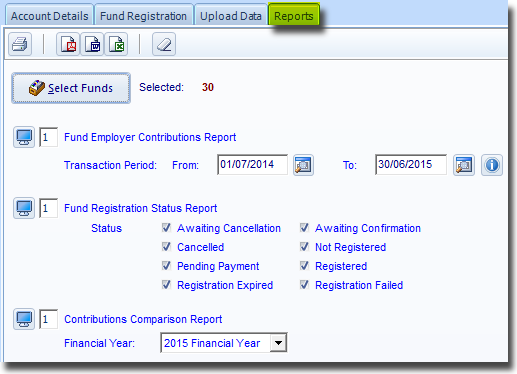 From this screen, you can prepare reports for a particular fund or multiple funds. Click to select a fund or multiple funds. This report displays all contributions recorded in the Transactions screen for the selected fund(s) and transaction period. This report will assist you in determining which fund(s) are still receiving contributions. By default, the Transaction Period picks up the dates you have under Administration | Defaults | Reporting. You can change the financial year to the year required. 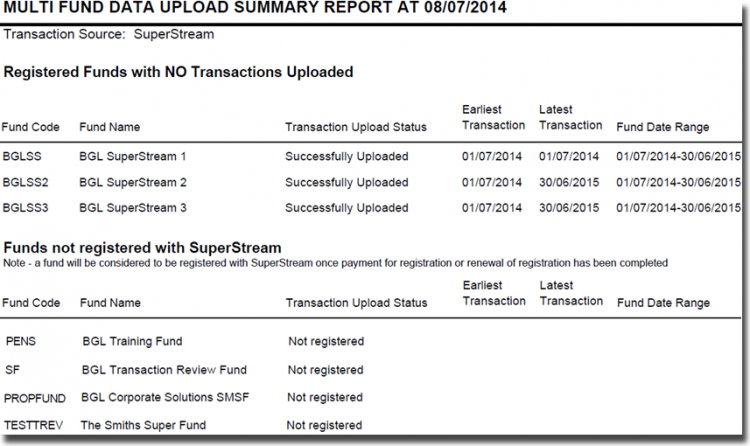 This report displays the SuperStream Registration status for the selected fund(s). 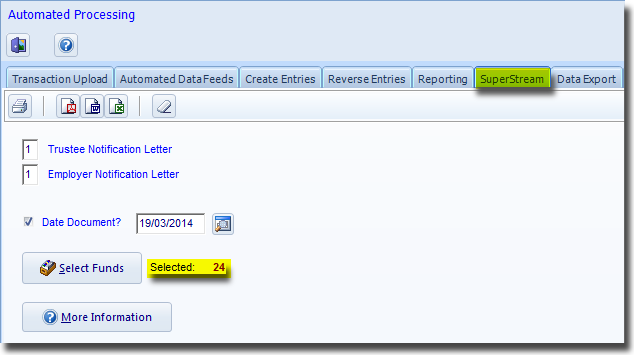 Select the status to display in the report by ticking the box(es). For example, to view a list of funds that require payment, tick the Pending Payment box. Note: Only funds with an ABN attached will display in the report. You can click to preview the report or click Print, , , Export to PDF, Word or Excel. This report compares all contributions recorded in the Transactions screen against the data downloaded from SuperStream on a yearly basis. This allows users to check whether all contributions have been correctly recorded during a financial year and match the SuperStream data. Any contribution amount not matching will be displayed in red. Click Select Funds to select the funds for which you wish to prepare the letters. Note: Preparing the letters from the Automated Processing screen will generate a Multi Fund Reporting Summary Report at the end with a list of the funds for which the letters have been created. The letters will be saved in the FUND folder located in the SFUND folder. From Simple Fund 2015.0, you can schedule a task to automatically download and upload contribution data in Simple Fund on a daily basis. The task will run automatically and unattended at the time scheduled. This task will be run for all funds registered for SuperStream. Warning: Ensure that the automatic feed starts at a time when no user is using these funds to avoid any conflict in the database tables and to prevent errors from occurring during the upload process. 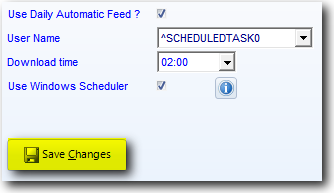 To schedule the feed, you need to go to Modules | Automated Processing | Schedule Tasks and click the SuperStream tab. Before you use this, it is highly recommended that you use the Multi Fund download first, so that each fund has a Last Upload date. The Automatic Feed will download transactions from the last download date. Go to Automated Processing | Schedule Tasks | SuperStream. Tick the Use Daily Automatic Feed? check box. 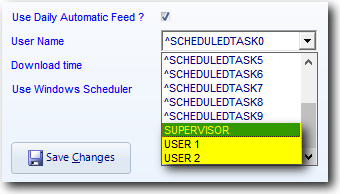 Select one of the ^ScheduledTask from the drop-down list next to User Name. Select a Download time when you want the Automatic feed to run e.g. 2am in Simple Fund. 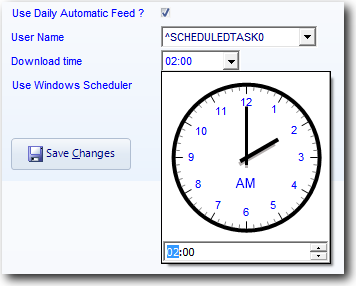 Tick the Use Windows Scheduler box. The following screen will display for you to enter the Windows scheduling details. Simple Fund will default the Start Time to five minutes earlier than the Download time. The Start Time is when Windows will open Simple Fund. You do not need to be logged in to Simple Fund for the scheduler to work. Windows will automatically open the Simple Fund at the Start Time specified above and Simple Fund will then download and upload the transactions at the selected Download time for the selected funds. Note: You need to be logged in as the selected user and leave Simple Fund open. Tick the Use Daily Automatic Feed? check box. 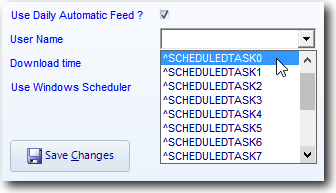 Note: You should select a Simple Fund username at the end of the list and NOT one of the ^Scheduledtask users. 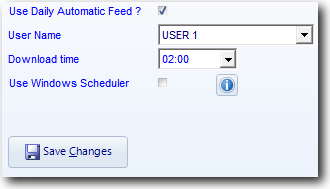 Ensure that Use Windows Scheduler is unticked. You need to leave Simple Fund open and ensure that you have logged in as the selected Simple Fund user. Simple Fund will then download and upload the transactions at the selected time for the selected funds. In addition, as part of the transaction creation process, the system will automatically create the SMSF Bank account in the Banks screen and Chart of Accounts if this bank account has not already been set up. You also have the option for Simple Fund to create the member account in the Members screen by ticking the Automatically create member accounts? option. This section goes through how to troubleshoot possible error messages that may come up while using the SuperStream screen. Error Message 1: Download data error. 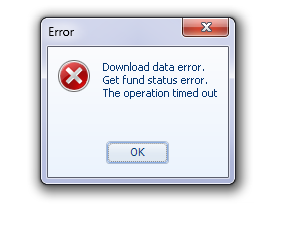 Get fund status error. The operation timed out. Error Message 2: Download data error. Get fund status error. The server name or address could not be resolved. Error Message 3: Entity code is empty in Register Funds tab. Error Message 4: Cannot Re-register a fund that was previously cancelled. Error Message 5: Register customer error. Rate limit exceeded, try again later. This error may come up if your internet connection is too slow. You will need to check your internet connection. If this error occurs repeatedly, contact BGL Support on 1300 654 401. If you connect to the internet through a proxy, ensure that the Connect using a proxy server?' check box in Administration | Default | Tasks/Help is ticked. If you have a username and password to connect to the proxy server, you will need to enter these details. You can click on Test Connection to check if you can connect to internet. You can click Save Proxy Settings to save the current proxy settings. You will need to fix the proxy server details you have entered. Once registration and payment have been processed and you cancel the registration, you will not be able to re-register that fund through Simple Fund or the Australia Post website. abn: The supplied ABN is an already recorded against the customer with status = de-registered. Please contact APSMSF support to re-register. You will need to email the Australia Post SMSF Gateway Team at superannuation@auspost.com.au to re-register a fund which has previously been deregistered. At this stage, this cannot be done through either Simple Fund or the Australia Post SMSF Gateway service website. Please try to create the account or register the fund again in a few hours' time. If a fund that you have not registered for SuperStream appears with the status "Cancelled" instead of "Not Registered" notify BGL Support on 1300 654 401. When contacting BGL Support, have your Fund Registration Status Report and the SuperStream Log ready. To access the Fund Registration Status Report: Select Data In/Out >> SuperStream >> Reports tab. To access the SuperStream Log: Locate your SFUND folder >> Select the DATAIN folder >> SuperStream folder >> Save the log file. Which gateway should I register with? What is the Electronic Service Address? Who will be handling the invoicing and payment? What happens if I migrate my fund from Simple Fund SF360? How to add additional recipients so that they can receive a copy of the transaction information? I am using another SMSF software that does not have a registered gateway, can I register with Australia Post? Which gateway does the employer need to choose from the list? I have received a fund from another accountant who has already registered for the Australia Post gateway for SuperStream? What do I need to do? The fund was registered through a trustee account or directly through the Australia Post website and you wish to move the registration under your firm account in Simple Fund in order to receive contribution data. This means that Simple Fund and SF360 will only integrate with that gateway. For your data to flow through into Simple Fund and SF360, you need to register with Australia Post. BGL will release Simple Fund and SF360 updates in May for you to easily and quickly register your funds in bulk with Australia Post within the software. As the accountant/administrator, it is recommended that you contact your clients (SMSF trustees) now and inform them of the new SuperStream requirements. You can let them know that you will be registering them with Australia Post through the BGL software and providing them with the necessary information for them to pass on to their employers. Simple Fund Version 2014.2 allows you to register your clients in bulk with Australia Post through Simple Fund. If you are the trustee and managing your own fund in Simple Fund, you can register your fund with Australia Post in Simple Fund Version 2014.2. There will be a $10 fee plus GST per fund per annum if you register through Simple Fund. This service will be provided free of charge in SF360. Australia Post will be in charge of all invoicing and payment. In Simple Fund, after you have selected the funds you wish to register, you will be directed to the Australia Post website for payment. For SF360, the service will be free. All renewals are handled by Australia Post. They will send you renewal notices close to the renewal date. Refer to FAQ 17281 for further information. Yes, you can cancel your registration at any time. However please note that no refund will be given. Refer to the Fund Registration tab and click on the Cancel Registration link. If you have already registered and paid in Simple Fund, no refund will be provided. In SF360, there will be no charge for this service. 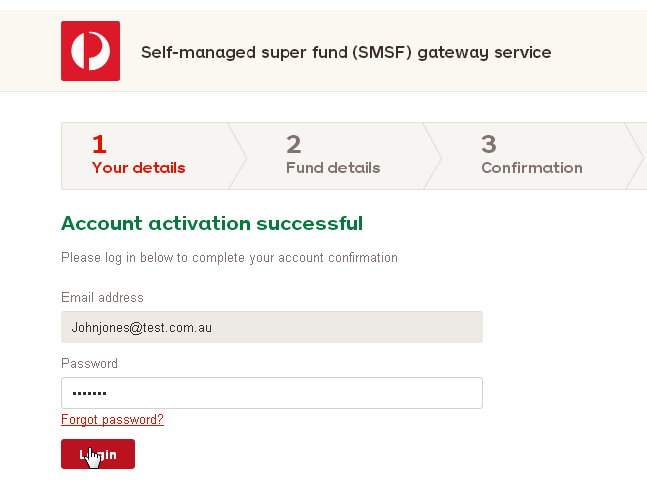 Login to the Australia Post SMSF Gateway Service website. Select List your funds on the left menu. Click Edit next to the fund. Under Communication preferences | Additional recipients, you can select an email address, stakeholder and delivery format (CSV or PDF). Multiple recipients can be selected. You will need to contact Australia Post at superannuation@auspost.com.au. Accountant A inherits a fund from Accountant B (Previous Accountant). Accountant B has already registered the fund to the Australia Post gateway for Superstream. What does Accountant A has to do to register the fund so that it is under their account? Accountant A needs to contact Accountant B so that the registration is cancelled on their end. If Accountant B is using Simple Fund, this can be cancelled through the software. Accountant A then needs to register for the ABNs under their SuperStream account in Simple Fund. Please note that a new payment is required for the registration. If the fund was registered through a trustee account or directly through the Australia Post website, Simple Fund will not receive contribution data. The trustee needs to cancel the original registration on Australia Post website. The accountant can then register the ABN under their account. A new payment needs to be made for this registration. The trustees/members did not provide the Australia Post Electronic Service Address (ESA) to their employer. The employer is provided with the ESA but they are not ready for SuperStream. For example, their payroll software is not supporting sending contribution data with the SuperStream format. Contribution data is sent to a Clearing House under Superstream format. However, the data sent out from the Clearing House is not under SuperStream format. Therefore contribution data will never be sent to Australia Post and Simple Fund or Simple Fund 360 will never receive contribution data. The fund’s ABN is registered in more than one gateway and contribution data was sent to a gateway other than Australia Post. In this scenario, the contribution data will never be sent to Australia Post and Simple Fund will never receive contribution data. Fund was registered directly on the Australia Post website (either by the trustee or your firm). In this case, Simple Fund will never receive contribution data. This page was last modified on 6 March 2018, at 16:45.